What is the Cultural Path? 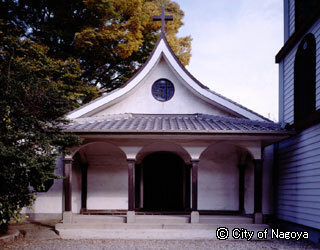 This church was built by Shusai Inoue, the first man to spread the catholic word in the Aichi-Gifu region, together with a priest names Turtan. 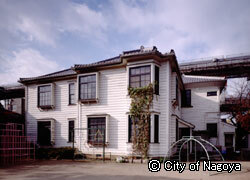 Indeed, the building is a very significant part of the history of catholic missions in the Nagoya and Gifu areas. The entrance and both sides of the outer chamber were extended after the Ise Bay typhoon of 1959 creating a corridor and transforming the church house into a triple-entrance-style. The three connecting arches at the front of the chapel are particularly beautiful, and the bell is a reconstruction of one built in France a century ago. <City Bus> 5 minutes' walk from the "Shimizuguchi" or "Shirakabe"
<Subway> 15 minutes' walk from the "Shiyakusho"
Copyright(c)2005 Cultural Path Futaba Museum, City of Nagoya. All right reserved.